That’s a question worth to be asked since it’s sucking my soul into a complete mess,literally. I spent days worrying over the characters, biting my nails (and fingers; it hurt!) when I was streaming and had little control over my emotional outburst. Whew. This is mad…. Anyway, enough of the chattering. Time to get serious with what I want to say. I watched the first 8 episodes in one go and at first, I just like the drama as a whole. I didn’t feel attached to any of the characters yet since it’s almost impossible to do so in a day, but as the time goes on and I continue to watch the series, I begin to think of them not as mere characters, but as human beings. I keep thinking what will happen to them, how they will act, and eventually hurting my head. The downside of being a drama addict is you’re adding problems to your already existing ones, but you can’t help but accept it because it gives you the pleasure of watching. Kangto, oh Kangto…you have so many names it’s hard to keep up with all of them! So the man has added a new job to his resume: a Gaksital.At first, the comparison is inevitable; Kang-san was a lot calmer when he was one, but Kang-to’s Gaksital role made an enraged first appearance at the station, running amok and eventually killed Kenji. So with the first appearance like that, I couldn’t help but have doubts and worries about how he will act out his multiple roles while keeping the act as a top secret of his life. I’m so glad that Kangto proves that he’s one brilliant man. True, he isn’t the best when it comes to everything, but he’s doing his best. For that, I really respect him. pulling a double role with splitting personalities isn’t easy and the calmness from his Gaksital counterpart gives a visible effect to his life as a Sato Hiroshi. He doesn’t let his anger takes over himself easily and he’s so composed, especially when Shunji’s snooping around and begins to suspect something is going on in Kangto’s life. Guess that’s quite a normal thing for superheroes to do, right? They need sensible minds to plan their moves. There’s a thing that I still worry about him: being a Gaksital means a huge burden is put onto him, which is to protect the Joseon people per what has been done by Kang-san before. I’m sure his brother will do the same thing if he’s still alive, but who is not worried for Kangto’s safety? He’s trying to take care of everyone, from the commoners to the freedom fighters and even gets directly involved with their plan. I’m afraid but I pity him at the same time; he’s everyone’s savior, but who’s going to save him should he be defeated and held captive? Luckily he still has his own knight in shining armor, Baek Geon. That just proves how lonely his life is. Poor Kangto. He’s worshiped by the Joseon people, but our new Gaksital is one lonely man. It’s like what his brother said before: Kangto will be confused at one point and he does, but it’s more painful when he doesn’t really have anyone to confide in with his inner conflicts. He might have Baek-Geon, but I think that mister was closer with his brother compared to him, and you don’t really tell your problems to someone who’s not that close with you, right? That mister seems to understand and I’m glad he’s such an understanding man. At this point, seeing him all alone in his cause to fight the Japanese makes it forgivable for him to care so much about the people around him. It’s good to see him going gaga over Mokdan and practically trailing behind her while secretly protecting his childhood lover. It makes more sense now, since she’s the only connection to his past, the time when he was a kind, loving boy. 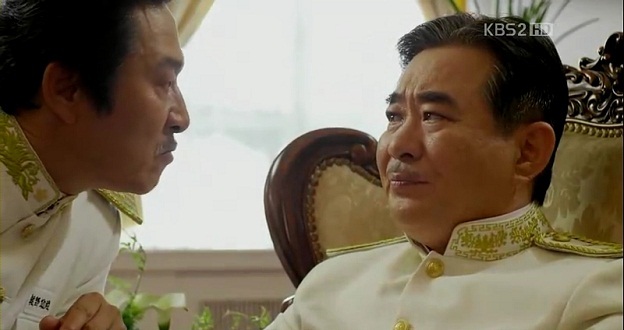 I think he needs to protect that connection and the person associated to his past; the only one who’s dear to him and alive, who is Mokdan. He’s pretty reckless at times when he’s being too protective over her and nearly get caught. It will be a matter of time before his secret is known, but I’m still hoping it’s not because of him protecting his girl. He needs a better, much more swanky situation for his identity to be exposed to the Japanese. It’s not fair for a great hero like him to be discovered easily like that. He might feel accomplished to do something for her, but will it be fair to us? Well, I am expecting something bigger for the revelation scene. And the scene will surely includes our new villain in the house, Shunji. We’ve come a long way since we first saw the kind Japanese teacher who loves his students and his bicycle so much. He was such a peace lover, enough for him to ditch his family’s staple job to serve the Japan Empire. How can this kind of man change so much, in and out? I was kind of expecting him to keep the kind persona to him, at least when he’s in front of Kangto, but he’s slowly losing that part of himself. It’s like the kind Teacher Shunji has completely evaporated into thin air. What’s left is the cold, untouchable Officer Kimura. I admit that from the moment he decided to step into the real game, admitting himself into the Imperial Police Force, I can only see death for him at the end of the series. Not because of redemption or anything, but I thought that he would be the one who dodge the bullets for Kangto, even if he gets to know about him being the Gaksital who killed Kenji. He was a dear friend to Kangto and he himself said that he can’t live without Kangto. After the recent episodes, my thought is still the same: he will definitely face his death in the end, but the reason is totally different. Say hi to the creepy Shunji. If his smile used to be sweet, now it’s plain creepy and psychotic. He’s too fixated on pursuing Gaksital and he’s losing himself in the process. Did he went somewhere and traded his kind soul for that kind of courage? He looks plain evil at the moment and sometimes, to the extent that I’m not sure if I am still looking at the same guy. He does have a dash of regret left in his system but it seems to be completely pushed out each time he’s with Gaksital. Like a vampire with blood, he turns into a complete lunatic when it’s anything associated with the masked traitor. Will there be any way for him to redeem himself after all the physical and mental tortures he’s giving to the people around him? Probably, but for me, there’s no other way than paying with his own blood. If he’s to be this consistent with his crazy acts, I predict he will die in the final battle with Gaksital, but I really hope he will die as the kind Shunji, not the baddie Shunji. It’s good if he’s to realize his mistakes, even if it’s at the final moment of the series. If we’re to do a simple Maths, add both guys above and we will get…. I really anticipated the back story of both Kangto and Shunji; how they met and what made them so close for them to be able to confide even the darkest secrets to each other. I find their story sweet. If only Shunji stays a sweetheart till now, I would ship him with Kangto. But fate (and scriptwriter) has a completely different fate and way for both of them. I can say that they are mirroring each other. Shunji is taking the road Kangto used to travel before this, pursuing Gaksital without even knowing that the enemy is actually the closest person to him. Both of them are so determined to catch the criminal, to the extent of it becoming some sort of addiction. The only thing that set them apart from each other is the causes. Kangto chased Gaksital because he wanted to get the recognition but Shunji is crazily tailing Gaksital because he’s ruining his family; killing his brother and humiliating his father. So the degree of determination is definitely higher on Shunji’s side and that explains why he’s so enraged each time he fails. 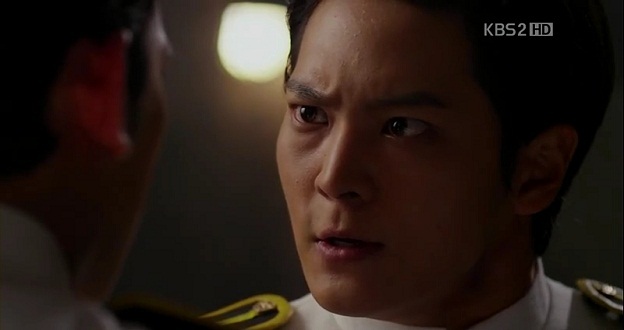 Okay, Kangto was so enraged too, but Shunji is scarier when he’s mad. Another thing that makes them mirrors to each other is their attitudes right after losing their family members. They’re completely behaving opposite of each other. Kangto decides to take the good side while Shunji slowly turns himself as one of the bad guys. The death gives different effects to them and eventually returning them to their rightful positions as a Joseon citizen and a Japanese. It’s heartbreaking to look back at their history and so much has changed since that time. 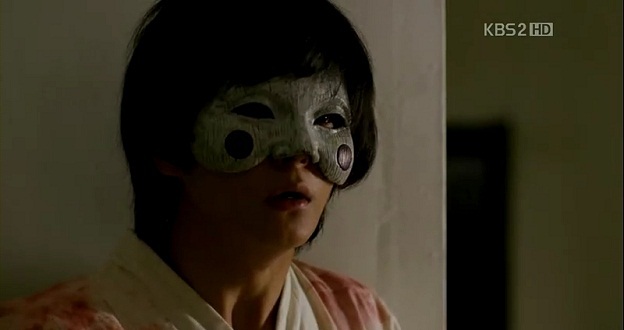 Shunji himself realizes that he’s changing into a monster but it can’t be helped. Kangto, who keeps the big secret to himself suffers even greater conflict because just like what he has experienced, Shunji will eventually face him and they have to fight with each other. Sometimes, fate is just cruel. Were they fated to meet because they would be enemies at one point? The truth is not pleasant at all, but considering that they’re originally standing on different sides, it makes sense. No matter how they avoid each other, they don’t have a choice but to face each other. Besides the real battle between them, they’re also fighting for the same girl, in which they’re playing tug of war. 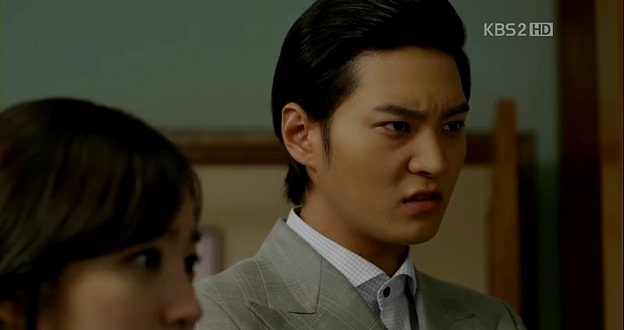 Shunji is quite suspicious about Kangto’s feelings towards Mokdan and for that, he tells him to torture her. That is one painful experience for Kangto, but he’s also smart to use the knowledge about Shunji’s feelings towards Mokdan against Shunji itself. Protecting her because he doesn’t want his friend to suffer because of her..seems like a kind statement. Both of them are brilliant. I’m still unsure whether she’s lucky or not. Being loved by two men is a blissful thing to be experienced, but it’s not all rainbows and cotton candies for our Mokdan. One guy is a baddie, the other one is deemed traitor. Nice. It doesn’t help that much when she’s the daughter of a freedom fighter. But still,she’s lucky to be surrounded by lovely people around her; her circus teammates, her father’s comrades, and last but not least,Gaksital. How lucky is her to be hugged and kissed by Gaksital?! Anyone green with envy? I like how she’s quite independent and cautious like her father, but she still has some limitations. I prefer her not to be a plain damsel in distress who needs to be rescued every single time by her heroes. Sure, she’s a tough cookie who has survived multiple tortures (and came out without many scars) but I really want her to stand on her own feet, taking matters into her hands. She has so much potential! Hopefully the writer won’t make her into a pushover girl, should she gets to know who’s the guy behind the Gaksital, because I don’t like a girl like that. Like come on, he’s a freaking superhero, so he knows what he has to do! (Getting emotional over here) Mokdan is a strong girl and she needs to gather more courage in order for her to be an amazing woman. How nice it is if she gets to escape somewhere and returns to the Korea few months later, transformed completely into a woman like Comrade Jeok Pa (Damsari’s ‘wife’). That would be brilliant and she’ll get to fight fair with Rie. Yes, I love her and I think she looks stunning in a dress like this! Because she’s juggling too many roles at one time and she’s good at disguise…thanks to her training in Japan probably. I wished to see her stepping inside the game herself and I am so glad when she decides to do it. She’s too pretty and talented to just sit and give out orders. She’s basically competent to be anything she wants when it comes to her disguise and she should be an actress instead of a singer. She even pretends in front of her father to avoid being punished or killed. Thumbs up, Rie! However,her Achilles’ heel might be Kangto. I’m not that sure, but she looks like she’s been infatuated with him since the day he saved her and she’s pretty dejected when Kangto shouted at her. Not to mention how she acted when she found out that the man she likes is loving another woman. Whoops. Rie is scary when she’s mad, just like Shunji. Poor Katsuyama. He likes you, so just accept her, Rie! I really like the drama. Yes, with my OTP I’m willing to go down with the ship! Although romance isn’t the main focus of the drama, it still manages to be awesome with the action and conflicts. Doing a drama that might touch some sensitive issues like this is a brave attempt of the production and I’m hoping they won’t be upset with the recent commentaries about the extreme details used in the drama. 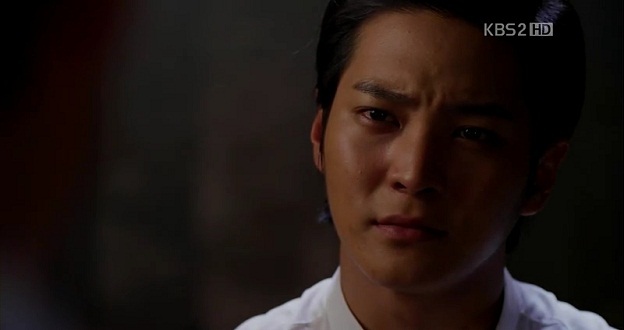 Bridal Mask isn’t a flawless drama: it does have some awkward moments and the development is quite slow at times, but it fits the drama length, since long dramas tend to be slower in their plot progress. I wasn’t that excited to hear about the extension news at first, because extensions seldom bring good effects to the dramas. True, the ratings might increase, but most of the time, the story isn’t that gripping anymore towards the end due to hasty addition of filler scenes and conflicts. But this time, since the extension is announced earlier, I am looking forward to the production team’s way of pulling the story so that it won’t be ruined. The only thing that makes me worried is the actors and actresses. They’re already doing the live shooting and it’s only the first half of the drama. Imagine working non-stop for the next two months. That would be crazy! Hopefully they’re able to stay healthy. The main characters are important, but the side characters make the drama merrier. I love to see Konno Koji and Wada Ryo together because they’re a hilarious set of sunbae-hoobae. Their relationship is currently strong, but I can’t predict anything for the future. And who doesn’t love the Count and the Countess? They’re indeed the mood maker of the drama and serve as the laughter source even at critical moments.I find it quite weird when the Count is the one who always blurts out random Japanese when the Japanese officers themselves don’t even speak Japanese. However, I can’t shrug off the thought about Sunhwa. She seems to be a minor side character, but she has the strongest ties with Shunji after Mokdan. The camera keeps panning at her reaction when Shunji is around, so I expect her to have greater contribution towards the effort of bringing back to the good side. My favorite scene to date is of course, the pep talk between future son-in-law and father-in-law. A simple yet meaningful conversation between two generations of freedom fighters. I wanted to ask my older brother this but because he died, I didn’t get to ask him. Like my hyung, like you, and like me, if you live like this, will the world change? They say the Great Japanese Empire, since Joseon isn’t enough,is going to conquer Manchuria and even China’s land. Isn’t that like hitting a boulder with eggs? I suppose it looks reckless, of course. One eggshell; such a trivial thing will probably just shatter on the boulder. However, no matter how strong a boulder is, it’s dead. While no matter how weak an egg is, it’s alive. As time passes, a boulder will break and become sand, but someday, a chick will hatch from an egg and step on that sand. The day the murderous legitimacy and violence of the Japanese Empire won’t be able to beat the egg will definitely come. And my second favorite…the hug and forehead kiss scene. Even though I have to leave now because of Father, I’ll pray. I’ll pray so that we’ll definitely meet again. I’ll definitely see your face, which has probably changed a lot now. Boon, even though I have to let you go for now, please just stay alive. No matter where you are or what you’re doing, I’ll definitely find you. I’ll find you, and I’ll protect you at any cost. I too am leery about the extension! The never bode well for the drama! Here’s hoping and praying we are wrong! *crossing fingers* it’s too early to judge it and the effects usually show themselves in the second half of the series..but I really want the drama to stay decent till the end! This drama is DAEBAK!!!! 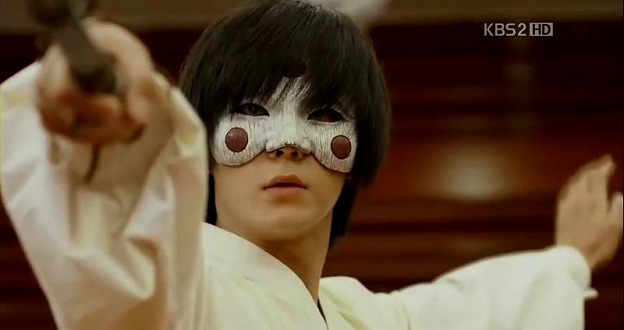 Sure, it does have some flaws in execution, but on the whole, Bridal Mask is (thus far) one of the best kdramas I’ve seen. The dysfunctional bromance(s) is the best part of this show, IMO. At the very least, this is what’s breaking my heart over and over again with each Kang-to/Shunji scene.